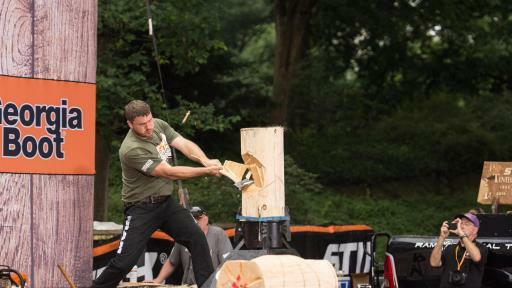 The STIHL® TIMBERSPORTS® Series announced today that the premier U.S. lumberjack sporting event will be held outside one of the biggest cities in the United States – Chicago. The Series’ U.S. Pro and Collegiate Championships will be held at the Tinley Park Convention Center, located in Chicago Southland, on July 15 and 16. U.S Athlete: Arden Cogar, Jr.
For the first time in the Series’ 31-year history, the Chicago area will host the Championships. The city’s large footprint, growing midwestern fanbase, and prodigious venue in the Tinley Park Convention Center, made it an attractive location for the sport’s biggest U.S. event of the year. 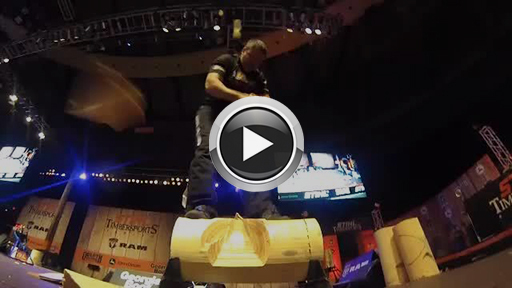 Since 1985, the STIHL® TIMBERSPORTS® Series’ has seen tremendous growth. 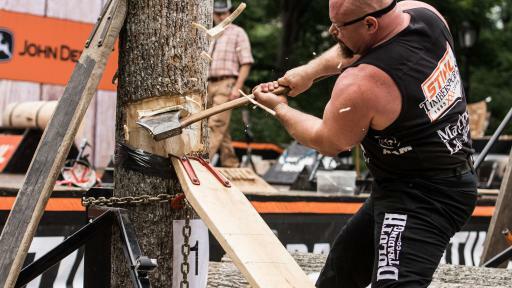 What started as a small, passionate, niche sport for professional lumberjacks has grown into a sport with global popularity, millions of fans, and tremendous viewership reach via broadcast and digital viewing. 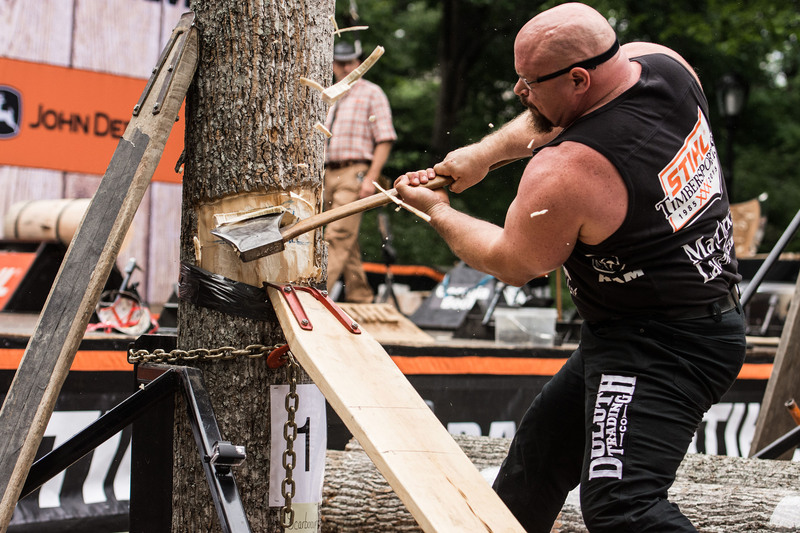 For the 2016 season, professional athletes hailing from all over the country will compete in six lumberjack disciplines: the hot saw, single buck, springboard chop, standing block chop, stock saw and underhand chop. Professional athletes will compete in four qualifiers, with the top 20 athletes advancing to the U.S. Championship. Collegiate athletes will compete in five qualifiers, with the winner of each advancing to the Collegiate Championship (along with one wild card selection). 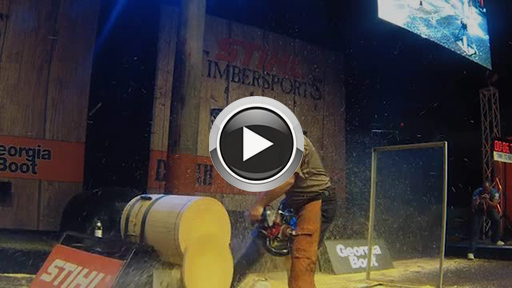 For the full season schedule, visit STIHLUSA.com/STIHL-TIMBERSPORTS/Schedules/. The 2016 athlete roster includes some of the best lumberjacks the Series has ever assembled. Reigning three-time champion Matt Cogar will look to make history and become the first-ever U.S. athlete to win four straight titles. He’ll be challenged by other young stars in Jason Lentz (who finished second last year) and Nathan Waterfield (who finished third). Other top athletes on the Series include legendary veterans Mel Lentz (seven career U.S. Championships), Arden Cogar, Jr. (three titles, two runner-ups) and Dave Jewett (U.S. record holder in the single buck). 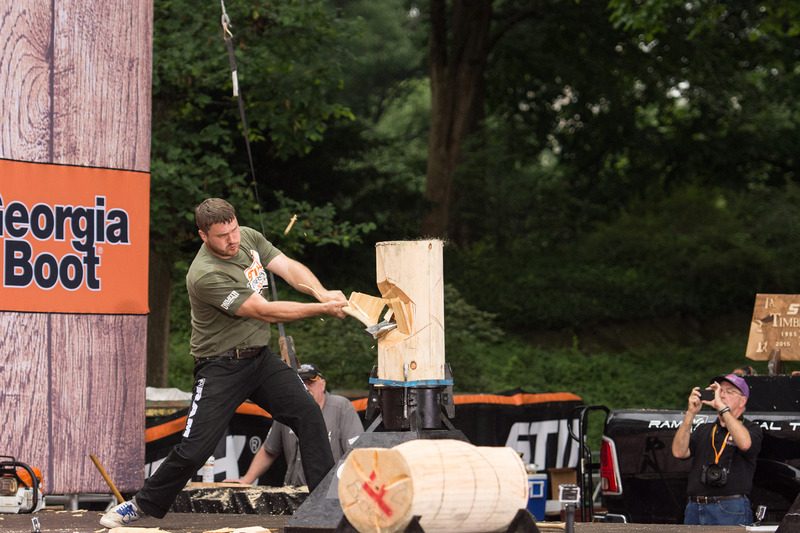 For a full list of athletes participating, visit: STIHLUSA.com/stihl-timbersports/athletes/. Ram Trucks is the Official Presenting Sponsor and the Official Truck of the Series. Additional 2016 official sponsors include The Duluth Trading Company (the Official Apparel of the Series), John Deere and Dinty Moore. Fans can also follow the Series through Facebook, Twitter, Instagram and YouTube. Tickets for the Championship are complimentary, and fans can make reservations for theirs by visiting TinleyParkConventionCenter.net or calling 708-342-5485, ext. 1. “The Village of Tinley Park and MIDCON Hospitality are poised to deliver a memorable event for the STIHL® TIMBERSPORTS® U.S. Championships, in hopes of making it a recurring program at the Convention Center,” said Daniel Fitzgerald, managing director of Tinley Park Convention Center. STIHL Inc. manufactures the world's largest selling brand of chain saws and produces a full line of powerful, lightweight, and versatile handheld outdoor power equipment for homeowners and professional users. STIHL products are sold through independent servicing power equipment retailers from coast to coast – not mass merchants. STIHL products sold through U.S. STIHL dealers are for distribution in the United States only. For more information or for the name of the closest STIHL retailer, call toll free 1-800-GO STIHL (1-800-467-8445) or visit STIHL's website at www.stihlusa.com.